Hi Kotaku, and welcome to the evening Off Topic post. You know Calvinball, right? It's the game that Calvin and his tiger Hobbes would play in Bill Waterson's genius comic Calvin and Hobbes. 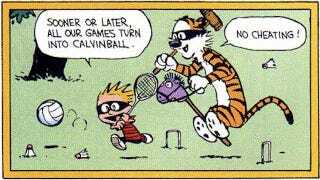 The whole point of Calvinball was that there are no rules other than the ones that have been made up in the heat of the moment. It's pretty much the "Yes, and" approach to game design. At his blog "Ruthless Culture," critic Jonathan McCalmont has written a fantastic, far-reaching critique of Prometheus (and beyond) titled "Calvinball Mythology and the Void of Meaning." It's… a hell of a thing. Go read it! He starts out by talking about the simple (and smart) observation that many longrunning mythologies like LOST and Twin Peaks are created with something of a Calvinball approach, where the writers are by necessity making it up as they go. Sure, some of those types of shows give the illusion of a master plan, but in reality (and this rings true for me), the endgame is planned out at about the halfway point, choosing among the many ideas to take the stickiest ones and decide to make them "real." Calvinball storytelling is a transitional approach to show-running in so far as it provides an operational bridge between treating individual episodes as self-contained stories and treating individual episodes as component parts of much larger narrative tapestries. Calvinball storytelling allows writers to focus upon churning out the best possible episode they can without overly worrying about how that episode will fit into the greater narrative. As Twin Peaks, X-Files and Lost demonstrate, Calvinball writers throw a lot of ideas at the wall and only some of them stick. It is only when writers of later episodes begin drawing on previously used ideas that the illusion of a deeper narrative structure begins to emerge. The article goes in a whole lot of interesting directions, culminating with a lengthy and thoughtful critique of Prometheus, which I'll admit I haven't even seen. But I'm still on the Calvinball thing. How great is this comparison! We're living in an age of unprecedented mythology—as McCalmont points out, there's a good argument to be made that even more than we crave stories, we crave mythologies. For all the involved, complicated lore created for any number of video games and comics, there is usually a feeling of Calvinballishness to it all. And yet I'm not always sure that removes meaning. I really mean that: I'm not sure! This merits further thought, and McCalmont's fantastic essay merits some digestion. But in the meantime, what do you think? Is it possible to have meaning if a mythology has been made up on the fly? Should a story be charted out from the beginning, and does meticulous worldbuilding necessarily have more weight than improvised worldbuilding? Am I the only one who cares even less about LOST lore than ever, now that time has passed? Feel free to comment about any of that here or over in the Talk Amongst Yourselves forum. Have good chatting, see you tomorrow.